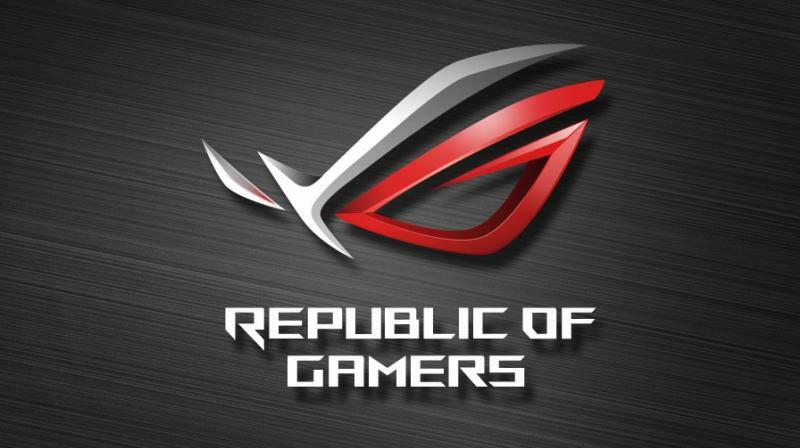 ASUS Republic of Gamers (ROG) today introduces its latest lineup of gaming laptops at CES® 2019. 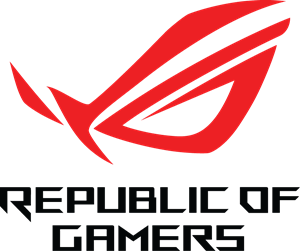 Includes the ROG Mothership, ROG Zephyrus S GX701, ROG G703, ROG Zephyrus S GX531, ROG Strix SCAR II, and ROG Strix Hero II. All have graphics powered by the latest NVidia GeForce RTX engines. This full top-to-bottom lineup is filled with updates that elevate your portable PC gaming experience. Across a diverse family of form factors from the ultra-slim Zephyrus S to the musclebound G703. Gamers have different priorities, so our laptops follow suit. The GZ700 desktop replacement emphasizes performance over portability with a traditional clamshell in the ROG G703. 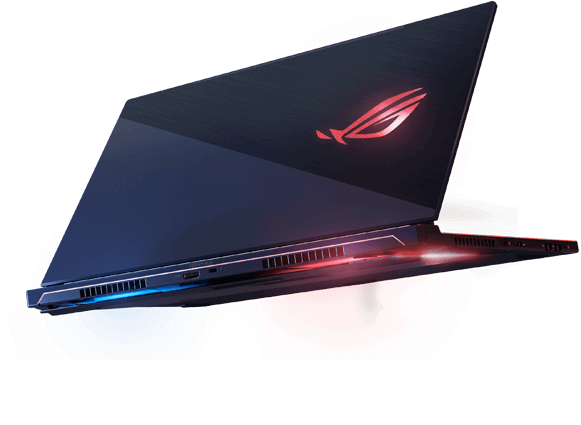 It is joined by the ultra-slim ROG Zephyrus S GX531 that’s augmented to go beyond gaming. The Strix SCAR II and Hero II reprise their roles in the eSports arena with portable form factors. Filled with competition-grade hardware. ROG G703 features an IPS-level display with a 144Hz refresh rate, 3ms gray-to-gray (GTG) response time. And NVIDIA G-SYNC™, allowing for super smooth gameplay even on Ultra graphics settings. G703 also features HyperDrive Extreme storage, which uses exclusive technology to combine three NVMe™ PCI Express® (PCIe®) SSDs in RAID 0 configuration for read speeds of up to 8700MB/s — the fastest ever on a laptop. Sticking to a familiar design imparts a different sort of versatility. The ROG G703 can sit on your lap in a pinch. Which for some will mean the difference between making and missing a deadline. Especially when on location or on the road. Despite being rooted in tradition, the G703 still incorporates the latest technology and features to ride the cutting edge. The Zephyrus S GX531 lowers its profile without scaling back on specifications. You get cutting-edge parts like the latest Intel Core i7-8750H CPU, a premium 144Hz refresh rate display. Plus all the ROG essentials. They are just squeezed into a slimmer package that lacks some of the extras. 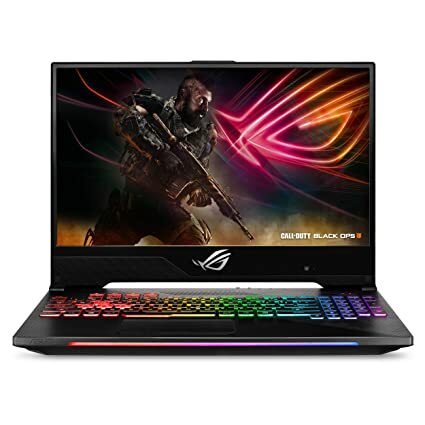 Available in the new compact 17” ROG Zephyrus S GX701. That makes the smaller Zephyrus S a more focused alternative for people who prioritize portability above everything else. Strix occupies a more mainstream middle ground between beast-like desktop replacements and premium ultra-slim gaming laptops. The Strix form factor melds performance and portability with distinctive designs that stand out from the masses. At the same time, super-narrow bezels blend in seamlessly, making it easier to get involved in the action on screen. Your hands will feel right at home on the desktop-style keyboard, which augmented by dedicated shortcut keys. For volume, mute, and Armoury Crate. 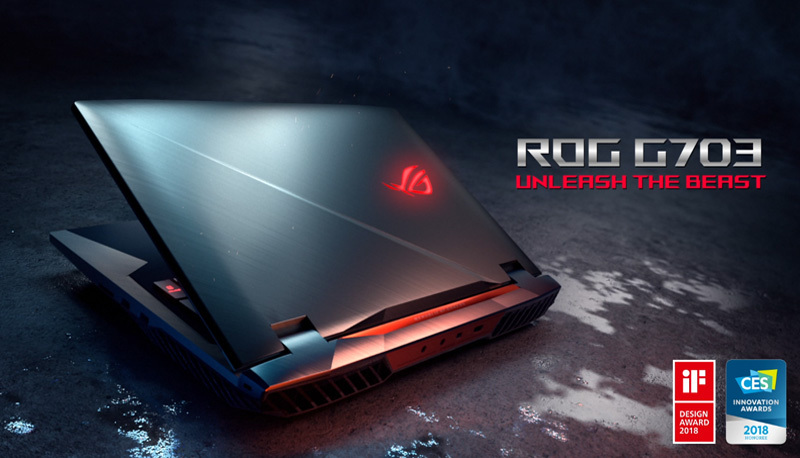 Enhanced lighting spreads an illuminated glow beyond the deck and onto not only the ROG logo on the lid. But also a diffused strip that runs across the front edge of the laptop. Addressable as two separate zones, this light bar casts an Aura Sync glow into your environment. Which offers a multitude of customization options. 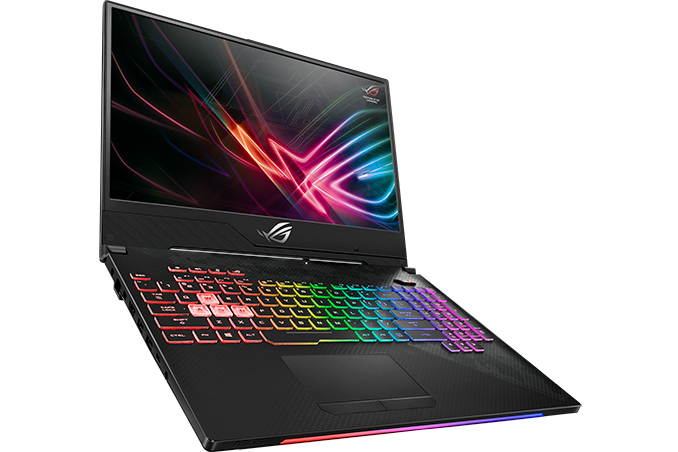 Designed to hit the sweet spot, the latest Strix gaming laptops available with six-core Intel Core i7-8750H processors. Backed by up to 32GB of RAM. They combine speedy solid-state system drives with a terabyte of additional mechanical capacity. That provides loads of space for larger game libraries. The auxiliary hard drive can also swapped for a faster SSHD that caches frequently accessed data to accelerate load times. Built for the FPS side of the esports arena, the Strix SCAR II comes in 15.6” and 17.3” flavors available with the same 144Hz refresh rate and 3ms response time. Both versions draped in a shooter-inspired motif that uses splashes of camouflage to create a unique aesthetic fit for the battlefield. Highlighted WASD keys further reinforce the SCAR’s roots and ensure that you can easily find the home row for FPS gaming. The Strix Hero II optimized for MOBAs and ideal for gamers who want subtler styling. Its contrasting textures and cyber-text patterns are more restrained than the aggressive aesthetic of the SCAR II, making the Hero II more approachable for wider audiences.